A parent’s top priority is to teach children kindness and help them grow into wholesome adults. The staff at St. Charles Borromeo has the same vision, which is why we provide children with these stepping stones to follow in God’s footsteps. To raise kind children we must first examine our own behavior. We can tell them to play nice with others, but it’s by watching how we treat people that they learn the true meaning. Remember that children look at us to learn how to maneuver social situations, and by setting a good example, they just might follow your lead. Children often have a very simple way of voicing what they do and do not want to do. This behavior is okay for most younger children, but as they grow older we can use it as a stepping stone to teach empathy. A lot can be accomplished by validating their feelings, talking through them, and then offering another point of view. We learn early in life that there’s a level of kindness that’s expected from everyone. We don’t give accolades for cleaning dishes or paying compliments to friends. However, when a child goes above and beyond what’s expected it should be rewarded, such as when they do extra chores or offer to donate their Christmas toys to charity. 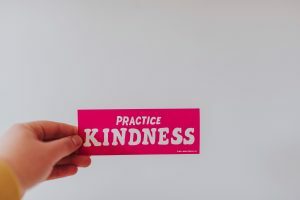 Kindness is something that children can pick up from many places in their lives—from their parents, their friends, and even their school. If you’re currently looking to enroll your children in an Orlando Catholic school, consider visiting us at St. Charles Borromeo. Through attention to our students’ educational and spiritual needs, we give them a strong foundation they need to grow into smart, compassionate adults who follow Him. If you want to learn more about our curriculum, you can find out more on our about us page. The weather is getting cooler as we quickly approach the holiday season. In early November, it will be time for the Feast of St. Charles Borromeo. The students at St. Charles Borromeo would like to take a moment to remember our patron saint. St. Charles Borromeo is the patron saint of bishops, cardinals, seminarians, and spiritual leaders. As you’ll see, he was a highly important figure of the Counter-Reformation in Italy. His dedication to God is something we all can learn from and embrace. St. Charles Borromeo was appointed as a Cardinal and Archbishop of Milan in 1560 by his uncle, Pope Pius IV. His uncle relied upon him while directing the third convocation of the Council of Trent—and St. Charles Borromeo continued to maintain the Council’s decrees after it closed. This led him to be instrumental in the 1566 Roman Catechism. After his uncle’s death, St. Charles Borromeo lived in Milan where he regularly visited more than 1,000 widely scattered parishes. He sought to apply the edicts of the Council of Trent to his own diocese by striving to end the sale of indulgences, reform monasteries, and simplify the interiors of ornate churches. His work didn’t end there—St. Charles Borromeo also fostered clerical education, established seminaries and colleges, and erected and entrusted colleges for lay students to the Jesuits. St. Charles Borromeo was later overcome by political turmoil, including surviving an assassination attempt and pleading mercy for his attacker. However, his great work within his communities led him to retain the support of many religious congregations. His heroic behavior during the plague in 1576-1578 earned him even more support. Even during turmoil, he continued to be a blessing to the community in Milan by giving away much of his wealth to give food to the hungry and care for the sick. Our community at St. Charles Borromeo hopes to be as helpful to others as St. Charles Borromeo was within his own community. As we approach the Feast of St. Charles Borromeo and remember his work, we will aim to follow in God’s footsteps and be blessings to those around us. If you have a similar vision and are looking for a Catholic school to help your children grow academically and spiritually, please consider visiting us at St. Charles Borromeo. 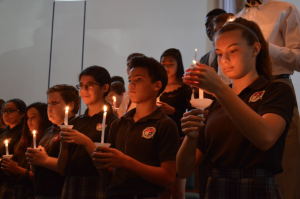 As a faith-filled community, St. Charles Borromeo Catholic School, an Orlando Catholic school, is committed to proclaiming the Gospel Message of Jesus Christ. We are cultivating responsible, respectful, trustworthy individuals who are confident in their knowledge and compassionate in His service. If you want to learn more about St. Charles Borromeo Catholic School, visit our blog page or contact us today! Parents want to see their children grow up to be the best that they can be. This means that living up to their full academic potential is a priority—but that spirituality, and fostering a relationship with God, is equally as important. St. Charles Borromeo, an Orlando Catholic School, is dedicated to helping our students grow academically and spiritually. We believe this spiritual growth should be reinforced at home. We would like to give you a few simple ways that you can help foster your child’s relationship with God. At the end of the day, young children may be tired or lack the attention span to pray. However, this is a great time to help them refocus on God through prayer. Instead of jumping straight into prayer, ask them: What are they thankful for today? Is there something they’d like to tell God today? This will help them to think about their spirituality and be more invested in bedtime prayer. Children love stories, but if they’re forced to read or watch tales that they’re not interested in, they may start to resent engaging in these forms of entertainment. Luckily there are many movies and books that children often enjoy—for example, the movies “Noah’s Ark” and “The Prince of Egypt,” as well as stories in the book, A Children’s Bible. Let them choose which story they want to hear, and they’ll be more interested in its message. Part of fostering a child’s relationship with God is helping them learn how to follow in his footsteps. One way to do this is to teach them to help others who are less fortunate. As we start approaching Christmas season, give them a small budget to buy a toy that they can donate to another child. Or, encourage them to donate one of their own toys that are in good condition. Children learn fast. 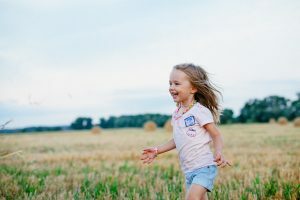 Building a strong spiritual foundation when they’re young can help them better follow God as they grow to be responsible and respectable adults. As an Orlando Catholic school, St. Charles Borromeo helps to form those important spiritual building blocks in students by incorporating faith into our academics. If you’re currently looking to enroll your child in a Catholic school, you can visit our about us page to learn more about what we offer. The Annunciation is an important event that, as an Orlando Catholic school, we at St. Charles Borromeo would like to take the time to remember. Let’s take a few moments to look back on the moment of The Annunciation and the reasons why it means so much to us. Annunciation is a fancy old way of saying “announcement,” and what a huge announcement this was; The Annunciation celebrates the day that Gabriel announced to Mary that she would birth the Son of God. This day is usually celebrated on March 25th, nine months before Christmas. This is meant to be symbolic of the length of a pregnancy. While the announcement itself is important, what we can learn from is Mary’s complete trust in Him. She does not doubt Gabriel when he announces her pregnancy. Instead, she asks how such an event will occur. Although she is legally married, she is still a virgin, and, considering the nature of her question, it may be implied that she is assuming she will have a virgin birth. Gabriel explains that all three Persons of the Trinity will make the birth possible—nothing is impossible with God. This is not an easy thing to accept or agree to. The pregnancy could tarnish Mary’s social status and potentially strain her relationship with Joseph. Others would assume that her pregnancy would have been caused by unfaithfulness. This task would certainly bring her suffering, both known and unknown. She could anticipate the stress on her social status, but she had no way of knowing that the Crucifixion of her child was yet to come. Despite this, Mary entrusts herself entirely to God’s will. Through God, she had free will to choose her own path, and she chose to trust in Him. As we approach The Annunciation, let’s remember the strength that it took for the Virgin Mary to trust in God so completely. Let’s remember the struggles thereafter that led to our salvation. And, in our day to day lives, let’s do our best to emulate that level of trust and devotion in His plan for us. 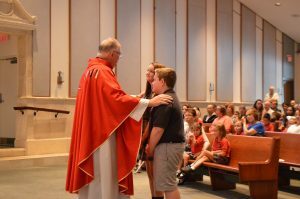 As an Orlando Catholic school, St. Charles Borromeo attends to the spiritual needs of our students so they can learn to trust in Him. If you’re looking for a faith-filled school that prioritizes both educational and spiritual needs, please consider visiting our community. You can read our about us page for more information about our community and what we stand for. 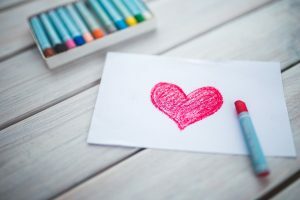 While parents show affection to their children year-round, Valentine’s Day is a special time devoted to reminding our loved ones that we care. 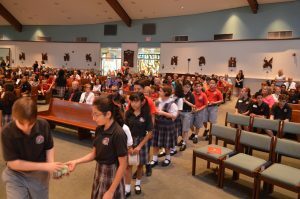 St. Charles Borromeo, an Orlando Catholic school, values the important relationship between parents and their children. If you’re wondering how to show your children you care this Valentine’s Day, here are a few options that can put smiles on their faces. It’s easy to get into the habit of telling your children you love them before you tuck them into bed, but are they used to hearing it at other times of the day? Try reminding your children that you love them at a time that they might not expect, such as during dinner or when working together on household chores. A little bit of surprise affection can stand out in their minds. Not everyone shows affection the same way. Don’t despair if your children squirm over extra hugs on Valentine’s Day—there are other options to show you care that are fun for the both of you. If your children enjoy telling jokes, spend some time listening and sharing a few of your own. If they enjoy arts and crafts, then dedicate the evening to working on a Valentine’s Day project together. They’ll appreciate the time you spend with them doing things that they enjoy. If you and your children don’t feel like spending Valentine’s Day indoors, consider looking into a family-friendly event in the community. This could be a great opportunity to spend time and deepen your bond with your children, as well as create some wonderful lifetime memories! For Valentine’s Day, St. Charles Borromeo is hosting a Daddy-Daughter dance on February 11th. It will be an amazing time to dress up for a fun night to remember! Every day spent with our children is special, so let’s take some time this Valentine’s Day to let them know how important they are. Whether you remind them that they’re loved or take them out on a night they won’t forget, your children will appreciate the time you spend caring for them. Also, if you want to make sure that they get the quality education they deserve at an Orlando Catholic School, please visit us at St. Charles Borromeo. We value our students and their futures, and we are dedicated to giving them an education that targets both their educational and spiritual needs. We hope you and your children have a great Valentine’s Day! Thanksgiving and Christmas are quickly approaching, and it’s time for the spirit of giving. Although your children are likely eagerly awaiting their Christmas break, it’s important to remind them the importance of giving back to the community during the holiday season. St. Charles Borromeo, a Catholic school in Orlando, presses the importance of giving back to the community. We would like to share a few fun ways that you and your families can be a blessing to the community this season. Giving trees are a great way to brighten up another child’s day. 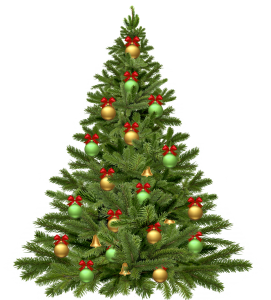 Find a giving tree in your area, and choose a child’s name off of the tree to give a gift. You can make a fun day out of taking your family out to find that perfect gift, and you will also be teaching your children to look out for others who may not have much to look forward to on Christmas day. Do you love to cook? If so, you and your family could be a blessing to others in your church. 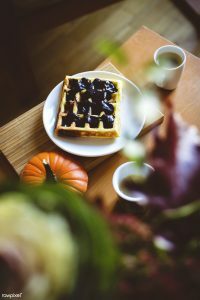 Consider hosting a dinner for widows and widowers who may not have many loved ones to spend the holidays with. The fellowship shared during a large dinner can be a great time for everyone involved. Orlando doesn’t see the harsh weather of northern states, but we do see a bit of a temperature drop, and there are many individuals who don’t have enough clothing to stay comfortable. If you and your family have clothes collecting dust in the closet, it may be time to clear them out and donate them to your local shelter. Those clothes will find a good home with those who need them this season. It’s difficult enough not to have proper clothing, but it’s a tragedy to not have food on the table. This time of year, many grocery stores offer ways to donate food to your local food pantry. Take a moment this season to donate a bag or two to those in need. If you want to donate directly to your local food pantry, take a moment to call them first. They will be happy to tell you which items are currently needed the most. Never forget that Christmas is the time of giving. As we celebrate the first coming of Christ and await His second coming, there are many opportunities available to give back to the community. Also, keep in touch with St. Charles Borromeo Catholic School as 2017 approaches. As a Catholic school in Orlando, we foster a community that is dedicated to serving our community throughout the year.